Laminated PTFE Fabric Belting Laminated HP series is engineered to maximize conveyor belt life while minimizing down time; fabrics are manufactured from PTFE coated woven fiberglass utilizing in-line laminating process; belts are extremely smooth and non-stick 11 mil in black, silver/black, gold N/A N/A Challenging applications such as food processing were there is a high level of grease and oils, or processing of sticky or gummy materials. 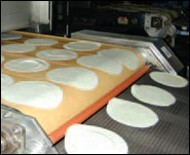 Typical applications manufacture of tortillas, pizza crust and pitas. Tear Resistant PTFE Fabric Belting Tear Resistant belts are the strongest, most durable line of PTFE coated fiberglass belting; manufactured from woven fiberglass substrates, with a high PTFE content 6 mil, 10 mil N/A N/A Tear Resistant belting has excellent flexibility and is ideal for use in small pulley and high-speed packaging applications. Anti-Static PTFE Fabric Belting Anti-Static belts are formulated to dissipate surface static build-up during operation; these black belts are manufactured from woven fiberglass substrates and are coated with PTFE; the Anti-Static belts have the best heat transfer properties 10 mil, 14 mil N/A N/A Applications where surface static dissipation is desired such as garment fusing and fabric lamination applications. Open Mesh PTFE Belting Open Mesh belts are manufactured from woven substrates that are heavily coated with PTFE; belts are stronger, more wear resistant with better airflow for faster curing and drying; also available in black belts which are UV resistant; window openings from 1/16" to 1/4" Tan: 30 mil, 31 mil, 44 mil, 48 mil, 60 mil Black: 44 mil, 60 mil N/A N/A Drying applications where air flow is required. 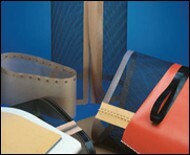 Screen print and textile dryers, non-woven processing and processes that require the circulation of hot air. Kevlar(R) Open Mesh PTFE Belting Kevlar(R) Open Mesh belts are manufactured from woven Kevlar(R) substrates that have been coated with PTFE; they are higher in tensile and tear strengths; they have window openings that range from 1/16" to 1/4" 27 mil, 42 mil N/A N/A Heavy duty applications or in drying applications where there is steam or moisture including textile dryer belts and carpet yarn processing. Premium Kevlar(R) PTFE Belting Premium Kevlar(R) belts are manufactured from woven Kevlar(R) substrates that have been coated with PTFE; they have higher tensile and tear strengths and are more coated with PTFE; they are more resistant to steam then fiberglass 7 mil, 14 mil N/A N/A High speed applications which require excellent strength to weight ratio. 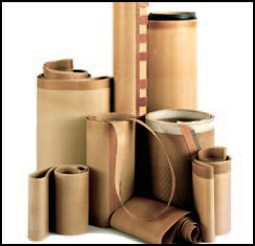 Used in environments where extreme strength, high loading, resistant to steam and long wear life is required. Silicone Belting Silicone belting is the most conformable, flexible, trackable and wear resistant product; made with woven fiberglass substrates that have been coated on one or both sides with silicone rubber. They provide a higher friction surface with different release Red: 15 mil, 20 mil, 25 mil, 42 mil, 102 mil White: 15 mil, 20 mil, 42 mil N/A N/A Applications where surface grip with excellent release is desired such as shrink tunnels or slightly inclined conveyors.